We all now exist in the ‘Knowledge Age’ with knowledge age people who are clued in, independent minded, assertive and want to give of their best. Yet most companies still rely on ‘Industrial Age’ management style and skills to handle this very valuable resource. The CHALLENGE is clear and significant – become GREAT LEADERS and reap the rewards for you, your people and your company through business and change management. How to develop untapped potential in your staffWe offer classroom training for all our Irish Customers. Great leadership is about creating these circumstances. It is a journey, not an event, and we stay with you all the way. Delivering significant business impact and ROI is the desire of most leaders whether executive, operational, or functional. Most know what’s involved and would probably paraphrase it by declaring that ‘it’s a journey not an event’. It is no less so for learning and development in any organisation. The benefits of delivering significant business impact and ROI are there for you also. It is a journey, and we are prepared to stay with you all the way. We can design appropriate interventions with you. Typically, these fall under three key areas; Leadership, Team Effectiveness and Personal Development. 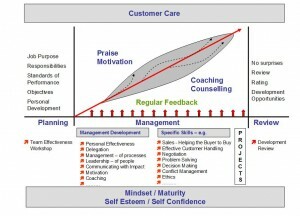 Please choose which applies best to your organisation.